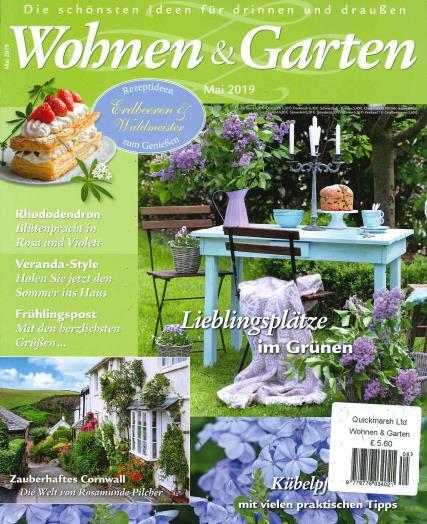 Wohnen & Garten is monthly German magazine translating to Home & Garden. Each issue is filled with the best ideas for indoors and outdoors, great recipes, creative guides and seasonal decoration. Buy a single copy or subscription to Wohnen and Garten magazine. Wohnen & Garten is published once a month and provides you with a wealth of inspiration for your home. From extraordinary seasonal decorations for your home to the perfectly designed table for a summery coffee treat. Packed full of inspiration for every season and occasion with tones of practical tips making these easy to implement. Also, explore exciting articles on beautiful places around the world with unusual renovated houses.